Mystery Photo No. 39 shows an aircraft overflying a ship, and we wanted to know. What the historical occasion was. Lots of folk responded, so the questions were too easy! They all correctly identified the aircraft as an F-111, and the ship as HMAS Melbourne. One or two people got the date and occasion wrong but the rest were spot on. Ben Kelly kindly provided the photo, which is of course Melbourne on her last journey to the scrapyards of China. She was under tow at the time, but that didn’t stop Ben and FltLt Keith Oliver both making a dummy approach to the old deck, but it was a bit small for the Pig to land on (wouldn’t that have been a scoop!). The image was taken by the strike camera in the belly of one F-111 as it overflew the other. 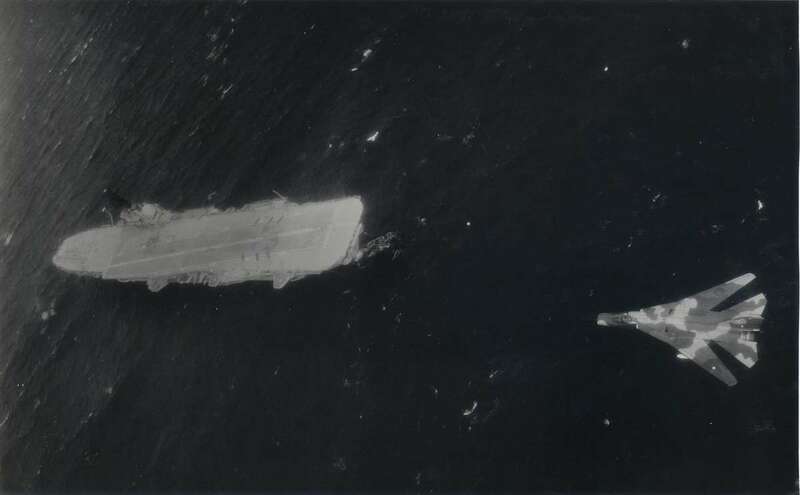 Ben’s best guess was that the image was taken on May 17th 1985 at around 1445 off the coast of Ballina. Mystery Photo 39 is quite possibly the last image we have of Melbourne in one piece, so it is of historic interest. 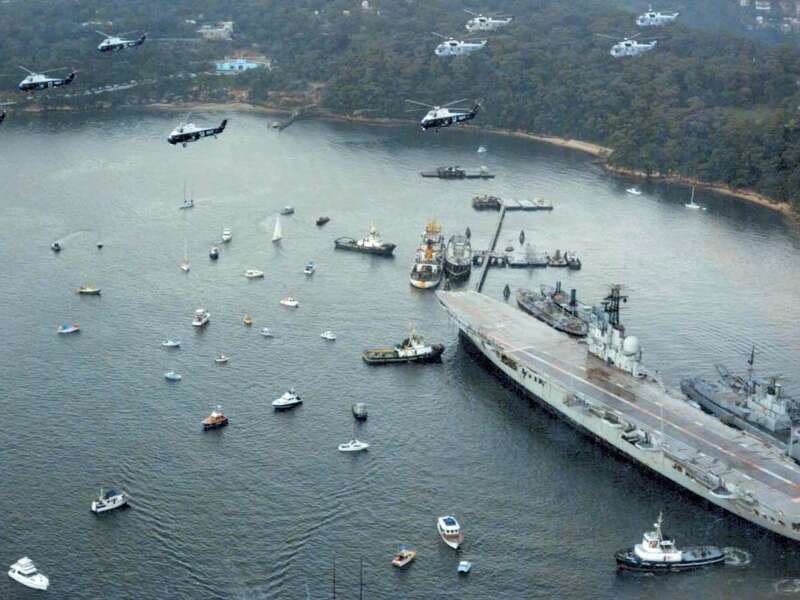 Melbourne was one of two Light Fleet Carriers purchased from the UK when the Australian Government approved the formation of the RAN Fleet Air Arm. 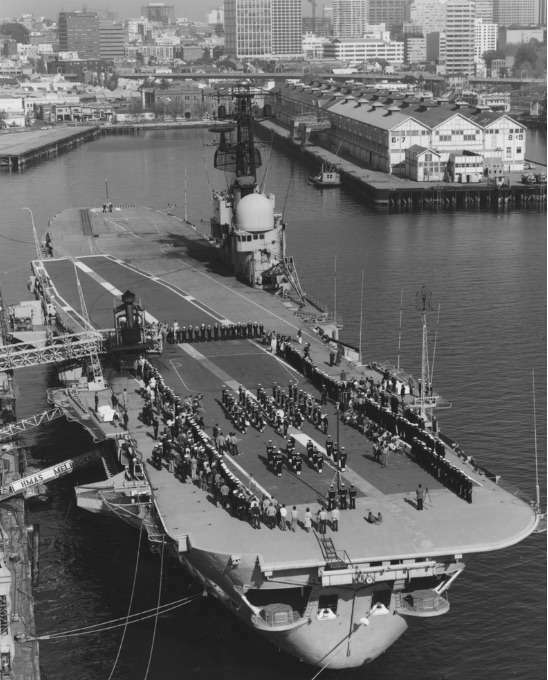 The first, HMAS Sydney, was delivered in 1948, but Melbourne’s delivery was delayed by the extensive work required to enable her to operate jet aircraft. 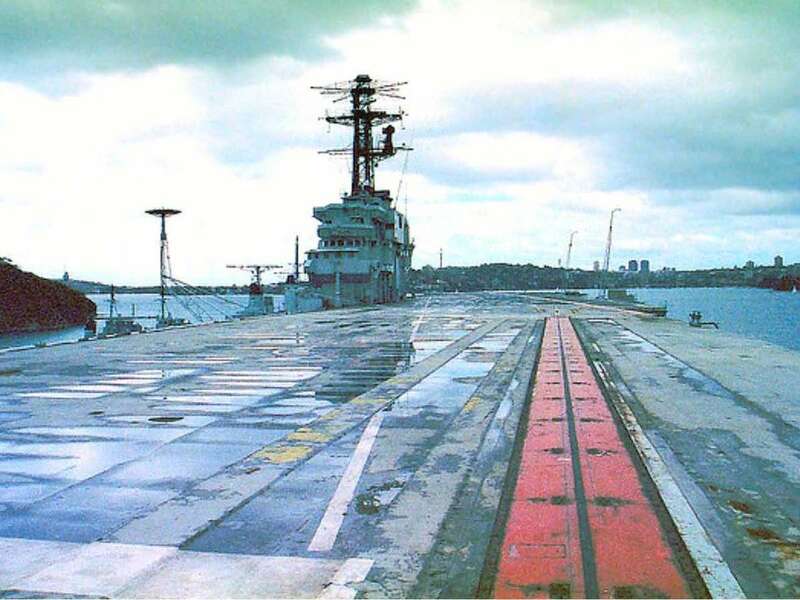 She was not ready until 1955 but boasted the most modern design features of any Dominion Carrier, including an angled flight deck, steam catapult and mirror landing sight. 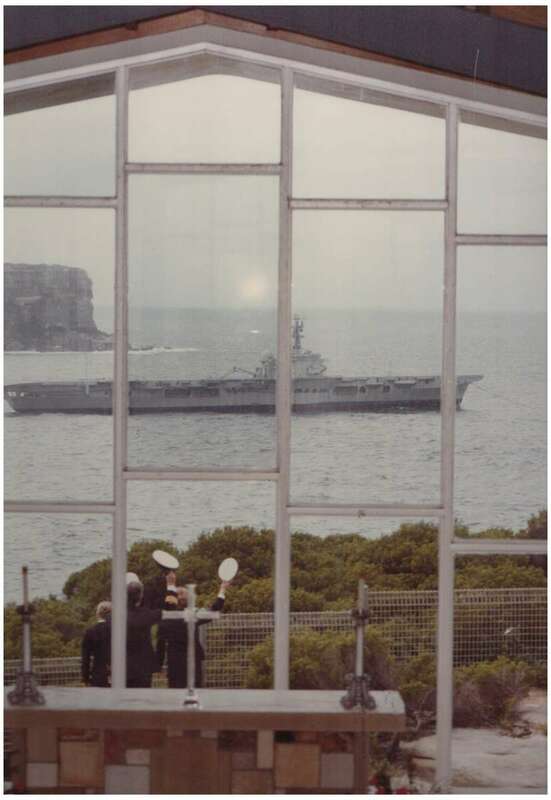 Her Service was marred by two collisions: first with the destroyer HMAS Voyager on 10 February 1964 resulting in the loss of 82 lives, and on 03 June 1969 when she 74 men were lost when she struck the USN Frank E. Evans. Enquiries into both incidents exonerated Melbourne. 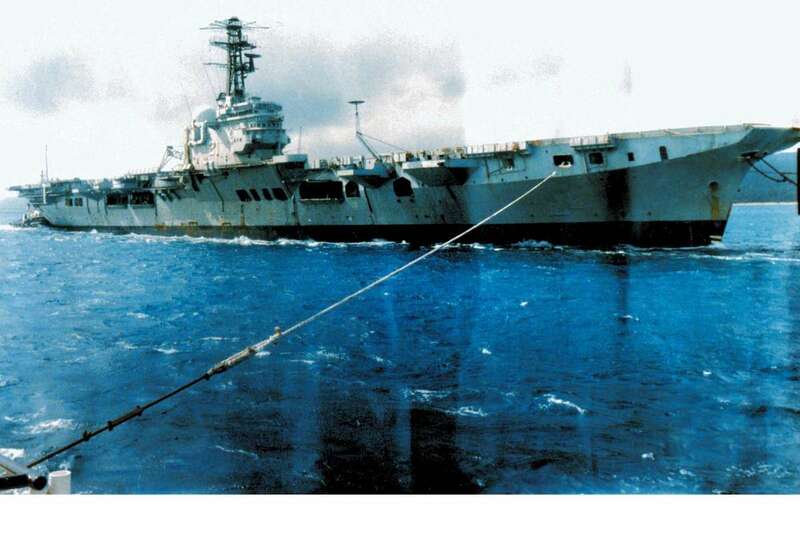 After a long and illustrious career, she was paid off from RAN service in 1982, because the Government announced the purchase of HMS Invincible as her replacement (which never eventuated). 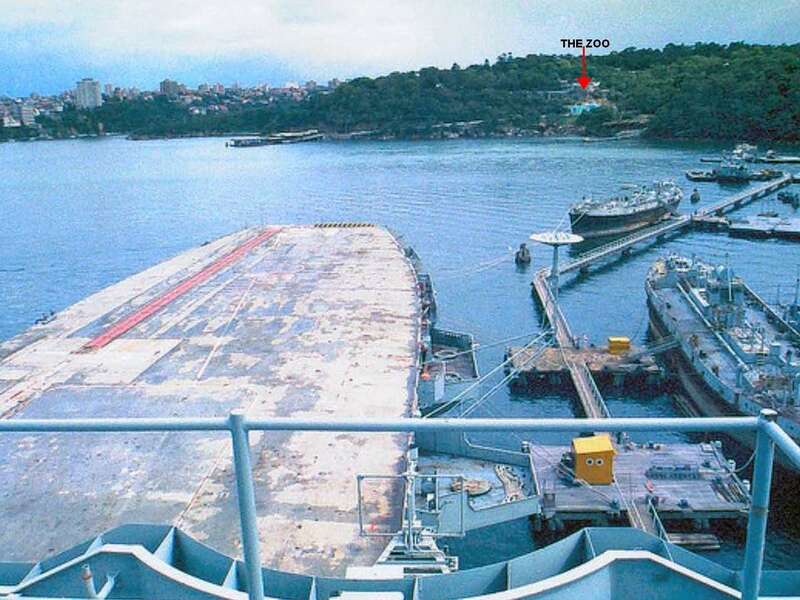 A proposal to use her as a floating casino failed, as did a 1984 bid to purchase her, so she was sold for scrap the following year and towed to a Chinese breakers yard. 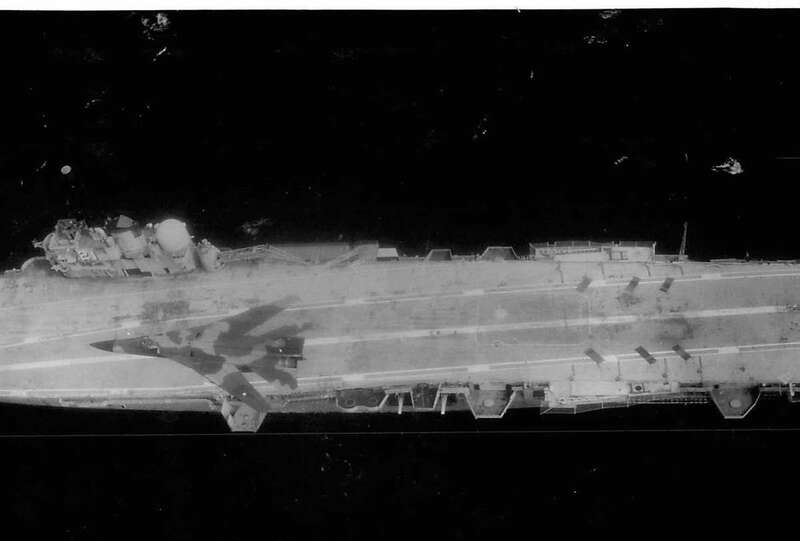 The scrapping process was delayed whilst the Peoples’ Liberation Army Navy studied her to help develop their own aircraft carrier, a task made much easier by the fact that her arrester and catapult mechanisms were still aboard, as was the radar. [1 & 2] Secured near Bradley’s Head, Melbourne awaits her fate as the elements take their toll on her. Having waited for nearly three years, even an ignominious trip to the scrap yard attracted media attention as Melbourne prepares for her last voyage. Melbourne passes though Sydney Heads for the last time. 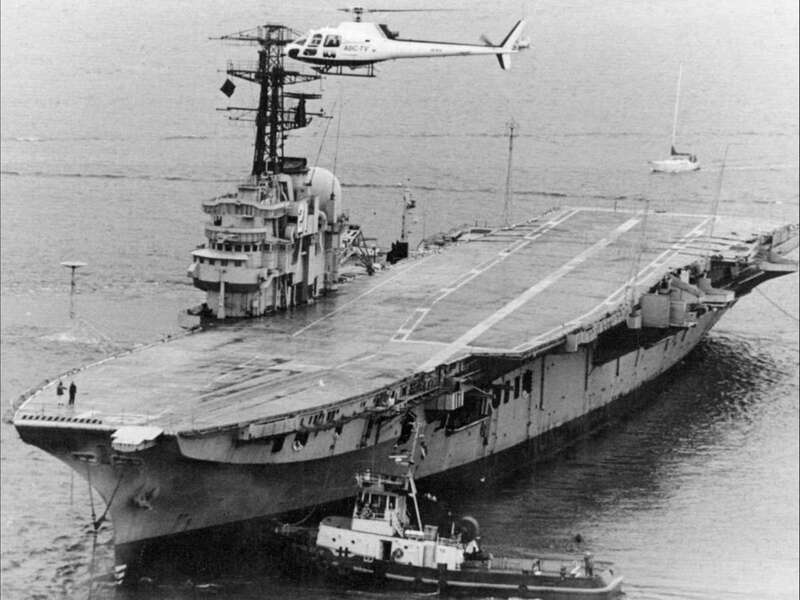 As Melbourne prepared to leave her mooring it fell to the Rotary Wing component of the Fleet Air Arm to pay its respects, as the fixed wing element had been disbanded. Below. One of the two F-111s prepares to overfly the old ship off Ballina. Not long afterwards she left Australian waters to eventually become Chinese razor blades.